People who have been diagnosed with anxiety or depression often feel like their job performance is endangered by their disability. They worry about job performance, which turns into an endless cycle of anxiety. The Anxiety and Depression Association of American reports that anxiety is one of the most common forms of mental illness, and that it can impact your health as well as your family life and your work life. For people whose anxiety or depression is so bad that it makes it hard for them to function effectively at work, a diagnosis may lead to treatment with prescription drugs and talk therapy. However, when the symptoms become too extreme, the person may not be able to work. In that case, they need to file a disability claim. 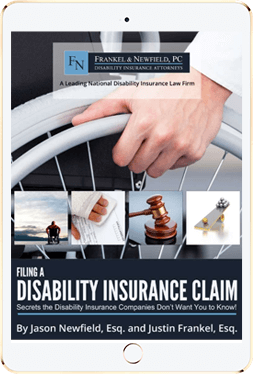 Disability insurance companies treat mental/nervous claims with a heightened degree of skepticism. The claims adjuster will review medical records in great detail, including efforts to secure treatment session notes, and seek to deny the claim. This is why anyone with an anxiety and depression diagnosis should speak with the disability attorneys at Frankel & Newfield. We have represented many anxiety and depression sufferers and know how the insurance companies treat their claims. Call the law firm of Frankel & Newfield today at this toll-free number 877-583-2524. We can help, and you don’t have to take on this battle alone.